For Women's History Month, we are happy to profile the lives of two New Brunswick women who made an impact in the worlds of literature and art. Nehemiah Beckwith, covered in a previous post on Atlantic Loyalist Connections, was the founder of the Beckwith family of Fredericton, New Brunswick. His descendants include the first Canadian-born novelist, an artist and a pivotal New Brunswick politician. UNB Archives & Special Collections is fortunate to have a cache of papers created by novelist Julia Catherine Beckwith Hart (1796-1867). The materials include original manuscripts of “Edith or the Doom” (volumes 1 and 2), letters, reviews, biographical material and rare copies of her first novel, “St. Ursula’s Convent”. According to Lilian Maxwell, novelist Julia Catherine (Beckwith) Hart was “born from the union of a Methodist New Englander and a Catholic French woman,” referring to Nehemiah Beckwith and Julia Louise Le Brun de Duplessis (b. 1774, d. 1863) daughter of Jean Baptiste Le Brun de Duplessis, one of Louis-Joseph de Montcalm, Marquis de Montcalm’s staff. Julia Louise came to Fredericton from Quebec as a governess or companion to a daughter of the Lieutenant-Governor of New Brunswick at the time, Thomas Carleton. Even though Julia Louise converted from Catholicism after marrying Nehemiah, it was her Catholic religion that would inspire her daughter’s book. 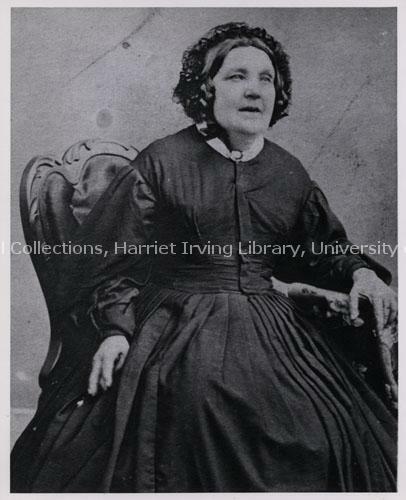 Julia Catherine Beckwith Hart, UNB Archives & Special Collections, UA PC 11, Item no. 9 (8), [18--]. Julia Catherine was born at Fredericton, New Brunswick on 10 March 1796. In 1824, at age 17, she published “St. Ursula's Convent; or The Nun of Canada, Containing Scenes from Real Life”, which was the first work of fiction by a native-born Canadian to be published in Canada. A copy of this rare book was acquired by UNB in November 1951, using a general book-buying fund at a cost of $37.50 from the “Old Author’s Farm” in Ontario. In 1825 she published her second novel, “Tonnewonte.” Julia Catherine Hart died at Fredericton on 28 November 1867. The next descendant of Nehemiah Beckwith to discuss is his granddaughter, Elizabeth Beckwith Hazen, whose works are part of UNB Archives & Special Collections. According to his grand-daughter, James King Hazen was "attractive ... but badly spoiled by his mother" who had lost an elder son to a tragic accident. Elizabeth, described by her grand-daughter as "a clever, studious girl of happy and cheerful disposition, tall, good-looking and with initiative," found the situation in Oromocto intolerable. In late 1860 or early 1861, Elizabeth's father travelled to Oromocto, picked up his daughter and two grandchildren, Edith born in 1858 and John Douglas born in 1860, and brought them "home" to Fredericton to live with her large and extended family at 750 Brunswick Street. Elizabeth never returned to live with James King Hazen. The 1871 Census records her as "separated from husband." James died in 1878. A skilled amateur artist, Elizabeth worked in various media including watercolour, oil, and crayon. She painted native wildflowers, with the help of the late Dr. Loring W. Bailey (1839 - 1925), professor of botany at the University, providing the botanical names. Elizabeth Hazen was one of Fredericton's oldest and most distinguished citizens at the time of her death on 22 July 1935. After her death, 123 watercolours of New Brunswick wildflowers came to UNB as a part of her son’s papers (Sir John Douglas Hazen). Most of the works are dated between 1867 and 1873. 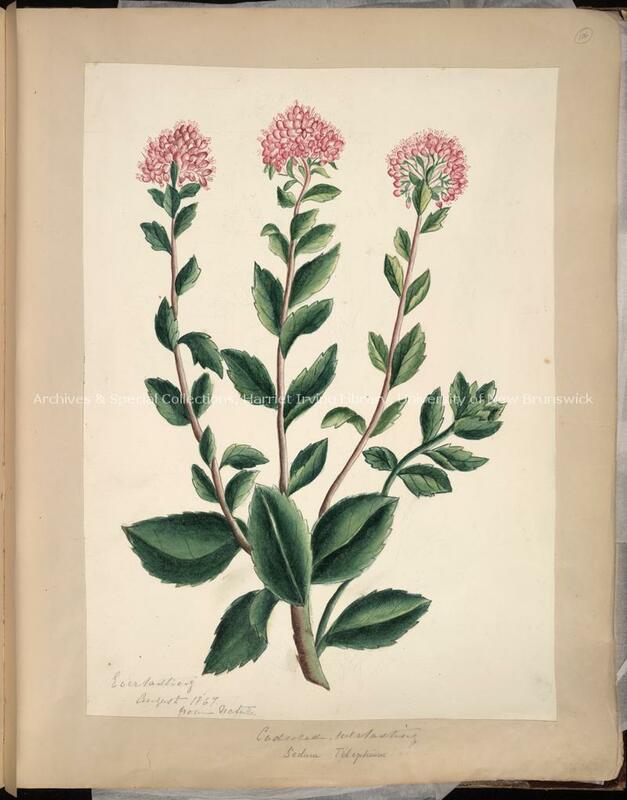 Sedum telephium, cudweed everlasting from nature by Elizabeth Beckwith Hazen, UNB Archives & Special Collections, MG H 13a, Item 106, Box 3, August 1867. Sir John Douglas Hazen was born 5 June 1860, the son of James King Hazen and Elizabeth Beckwith. Educated at the University of New Brunswick, he was called to the provincial bar in 1883. The following year he married Ada C. Tibbits of Fredericton, New Brunswick. He practiced law in Fredericton from 1883 to 1889 and in Saint John from 1889 to 1917. While in Fredericton, he served as mayor from 1888 to 1889. Hazen was first elected to the House of Commons as a Conservative member for Saint John in 1891, but was defeated in 1896 and turned to provincial politics. In 1899 he was elected to the New Brunswick Legislature as a member for Sunbury County, leading his party in Opposition between 1899 and 1908. When the Conservative Party won the election of 1908, he formed a government in which he held the posts of Premier and Attorney-General. Hazen resigned his provincial posts in 1911 to fill the portfolio of Marine, Fisheries, and Naval Affairs in Robert Borden's Dominion cabinet. He was elected to the House of Commons as a member for Saint John by acclamation. As minister in charge of naval affairs during the First World War, Hazen contributed to the Canadian war effort. He was a member of the International Fisheries Commission (1917-1918) and attended the Imperial War Conference in 1917. He resigned his portfolio in 1917, following his appointment as Chief Justice of New Brunswick, a position he held until his retirement in 1935. J. Douglas Hazen died on 27 December 1937. 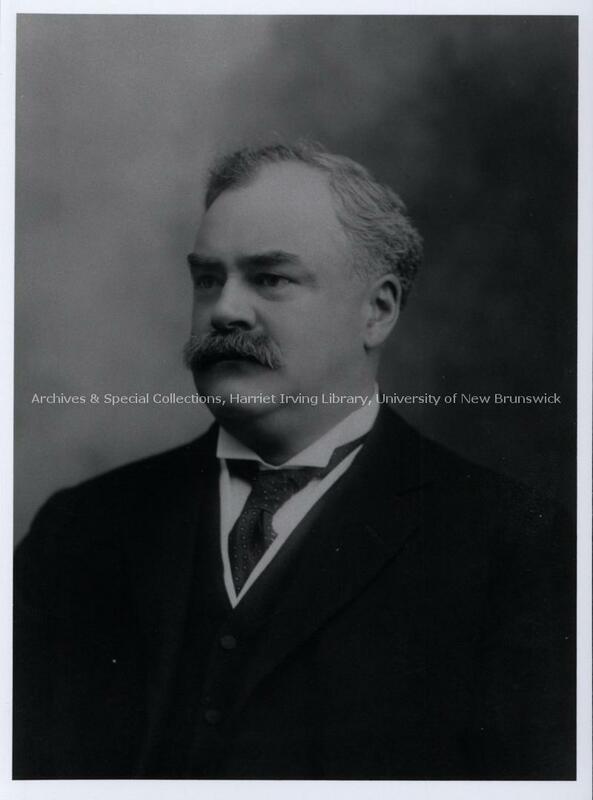 John Douglas Hazen, UNB Archives & Special Collections, Series 1, Item no. 41, File 3, [19—]. While Hazen was acting as minister of Marine and Fisheries, his correspondence was stored in Ottawa. It was removed from Ottawa in 1917, we think to the family home and stored in the carriage house. A fire in the mid-1950s destroyed many of the Hazen records and damaged others, however what was left (primarily private political correspondence from 1911-1917) was given to UNB after which they were conserved and made available to researchers. Other bits and bobs of Beckwiths appear in the UNB Archives database, including a copy of a letter to Provincial Secretary John Beckwith from Edward Wilmot, a petition by [N. Beckwith Hart] to King’s College, and headshots of Henry Beckwith and J.A. Beckwith. The Beckwith story is that of a family that illustrates the arc of many New Brunswick families over time, arriving here as pre-Loyalists or Loyalists, and become intriguing historical figures who leave behind documents and images through which we may interpret their lives.